In Kentucky, the first Saturday in May each year is a big day – it’s Derby Day. And my home city of Louisville hosts literally tens of thousands of visitors who come to witness the “most exciting 2 minutes in scports” – the Kentucky Derby horse race. 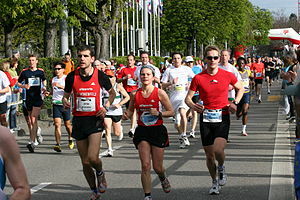 But each year on the Saturday before Derby Day another big event happens here in Louisville – the annual Mini-Marathon. The “Mini” is a 13.1 mile “race” where thousands of participants run, walk, jog and wheel up and down hills and through the streets of downtown Louisville. The participants even pay for the privilege of participating in the Mini. A few very bold souls “go the extra 13 miles” and run in a full marathon. Years ago I ran in the Mini. It was my one and only time (so far). Even though I didn’t even attempt to run this year, I am proud to say that there were somewhere between 10 and 20 people of whom I am personally aware from Adventure Christian Church who dedicated themselves to completing this race in 2013. It is quite an undertaking. It takes months of training. The Mini is not something you can just decide to do on a whim. As I listened to stories about people’s experiences with the Mini, something remarkable struck me this year. For many, the Mini – both the running in it and the preparation for it – was not about the race itself, but about CONNECTIONS with others and with God that were made in the process. Their stories of perseverance and fellowship are remarkable. For example, one friend, Russ, was injured during his training several weeks ago. He had to stop training altogether. It would have been easy for him to give up and say “well, there’s always next year.” But he didn’t. Once he could run again, he did. Russ finished the race this weekend. Then there are others who told me that what they loved most about the experience were the friendships that they made with other people with whom they trained. One person told me that she would probably have never become so close to one of her training partners if it wasn’t for their common goal of preparing for the Mini. During their Mini training, their connection became a lot more about more important things than just finishing a race. They became Christian sisters. There were many other stories about how people encouraged one another, cheered one another on, lifted each other up when they didn’t feel like they could make, and on and on. And, finally, and one of my favorite comments from the day, was a man from our church who said that he hoped to start a training group at our church within the next month to start preparing for next year already! Just think of the friendships that will be created if that dream transpires! When we set our minds to something, and remain dedicated to it with a plan, there is a high likelihood that we can accomplish the goal. If we can apply that same “rule of dedication” to other things in our lives – such as learning the Bible, making a difference in our community, etc. then we will truly be blessed. When we seek to accomplish “big things” people are inspired to seek to do big things themselves. Personal connections, friendships and Christian fellowship can happen in all sorts of places — even on a path wearing sneakers and walking with a training partner. Personal connections don’t just happen in church small groups and Sunday school classes (although those are important). They happen when “regular life” is going on. We can learn the gift of encouragement by cheering on others when they are doing something difficult. And, again, I am hopeful that those encouragement skills and habits transfer over to other areas of our lives. When they do, the body of Christ will be that much stronger. Well, that’s all for now on this topic. It was a good weekend. I am proud of my brothers and sisters who really accomplished a remarkable thing and inspired me and many others to live more disciplined, dedicated and encouraging lives in all areas of life. Thank you all and God bless you! Last week at Adventure Christian Church, we began our study of the Gospel of Mark. For most of the next 20 weeks, our messages on Sundays will focus on the life of Jesus as told in this Gospel. The first series from this study we have titled: “The Power of Jesus.” This post’s notes relate to the first sermon I preached on April 7 which I titled: “The Power of Jesus Is Bigger than Your Issues”. As always, you can go to our church website to hear the podcasts. What is the Gospel of Mark about? — Mark shows us that God is a God of new beginnings, reminds us of the foundation of our faith, and also provides an example of peace in the face of persecution and opposition. These themes will be shown repeatedly throughout this Gospel. note: These two men were willing to put aside their social alliances and comforts (i.e., their family). Are we willing to sacrifice our social structure and comforts for the One who is even more powerful? to “leave” = “to depart from permanently” (note: they didn’t just leave for a day – they were going to be different people, with a different social bond). note: This man had been plagued in the past by an evil spirit. We all have our own past evil spirits that dwell within us that we can easily allow to fill us (for e.g., regret, abuse, unforgiveness of self or others, past sins). Jesus has the power to remove our past evil spirits and set us free. note: This issue was not directly Simon’s. Instead, someone close to him had an issue which undoubtedly affected him too. That happens to us – we have friends and family who have “issues” that cause trouble in our lives. However, when we introduce Jesus into the picture of that person’s life, He can overcome those issues as well. note: There is nothing more personal than a skin disease. It was painful and even more devastating it caused the person to be unclean and therefore shunned. We can allow our personal sins that make us so unclean to keep us from the people who can help. We can get caught up into thinking that we aren’t worth Jesus’ healing power or that He can’t help. But he can. He has power over our sin. The leper was worth the effort — and so are YOU! !